On Sale Now! Free Shipping Included! Save 4% on the Tiny Tim Totes 83-DT5571 Premium Combo | Christmas Storage 10 Foot Artificial Tree and 30 Inch Wreath Bag, Green by Tiny Tim Totes at Ondertitels. MPN: 5708 XL Tree Wreath Set Green. Hurry! Limited time offer. Offer valid only while supplies last. Clean up after the holidays are a snap with the Premium Green Canvas Christmas Tree Bag and Premium Canvas Christmas Wreath Bag from Tiny Tim Totes. Clean up after the holidays are a snap with the Premium Green Canvas Christmas Tree Bag and Premium Canvas Christmas Wreath Bag from Tiny Tim Totes. A must-have after the holiday season, an Tiny Tim Totes Christmas tree bag and Christmas Wreath Bag will store your tree and wreath away neatly, effortlessly, and make for quick setup next year. It's as easy as placing your artificial Christmas tree and wreath in the bag, zip it up and safely store it away until next year. Because our tree bag is a full 65 inches long, 15 inches wide, and 30 inches deep, you will have no problem storing disassembled artificial trees and accessories up to 10 feet tall. Our wreath bag is a full 30 inches long, 30 inches wide, and 8 inches deep, you will have no problem storing artificial wreaths up to 30" in diameter. Both bags have sturdy vinyl carry handles for easy transport. No assembly required, just unpack, unfold, and insert your tree and wreath. 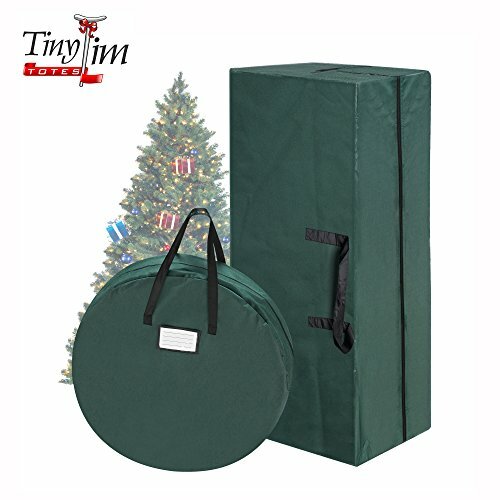 Tiny Tim Totes Deluxe Green Holiday Christmas Tree Storage Bag Extra Large For 9 Foot Tree: Specifications: Measures 65" X 15" x 30" (LxWxH). Made of Premium 600d Oxford Canvas. Sturdy Carry Handles for transporting your tree. Holds up to a 9-10-foot-tall Christmas tree. Moisture resistant, keeps out dust and pests. Folds flat when not in use. Heavy Duty Full Length Zipper. Designed to protect your tree from damage, dust and moisture! Full 1 Year Warranty. DURABLE: Strong 600d Canvas, designed to protect your tree and wreaths from damage, dust and moisture. EXTRA LARGE: Tree Bag Dimensions 65" x 15" x 30", designed to hold a 9-10 foot disassembled Artificial Christmas Tree. SPACIOUS: Wreath Storage Bag is large enough to hold a 30" diameter artificial Christmas Wreath, up to 8 inches thick. LONG LASTING: Constructed with heavy duty zippers and identification holders. CONVENIENT: Stores your artificial wreaths and tree away neatly, effortlessly, and make for quick set-up next year.